Swanson, the makers of the ever popular Speed Square, have come out with a new layout tool that does it all, or almost all. Their new Speed bevel has all the features and looks of their classic Speed Square, but with a little transformer magic, turns into a T-bevel. With a little more transformation you have a try-square; in total the Speed Bevel offers 5 different layout tools in its one small fold-able package. Heck, the fact that you can fold down and make a Speed Square smaller, is all it took to sell me on the idea; I can never seem to find a good place to store my rafter square because of its shape. Whether you build houses for a living, or you just want a multifunctional tool from the best name in leveling and layout, the Speed Bevel will handle the job. 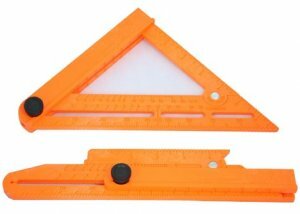 Made from tough, light-weight, high-impact ABS composite, the Speed Bevel is actually five tools in one – a framing/rafter square, a try square, a miter square, an angle finder/protractor and a sliding T-bevel. The Speed Bevel takes the place of a few tools I use regularly, and most importantly, I don't really use any of those tools at the same time. I like the idea of cutting weight and a few items from my toolbox, the only question I have is, how accurate is it? An un-square square would be a very bad thing. The Speed Bevel cost around $7, and is about the same as a regular Speed Square.